It’s finally happening! I’ve been saying I’m going to build this for so long and it’s finally happening. A go kart has always seemed a brilliant idea. Not a petrol one, mind, but an electric one. There’s something more enticing about an (almost) silent electric motor when compared to a noisy, smelly petrol engine – plus the fact that an electric motor will wheel spin and not care. I’ve wanted to build one for a while, then had the daft idea of “ohhh Clas Ohlson sell a garden trolley with 4 wheels and a frame for £80!” – cue the sound of me mashing my PIN into the card terminal and ordering a taxi back to the Hackspace with Nav because the thing was that heavy – neither of us felt up to the task of carrying it the half mile on a hot summer’s day. This was ~2 years ago – so just a while ago now. 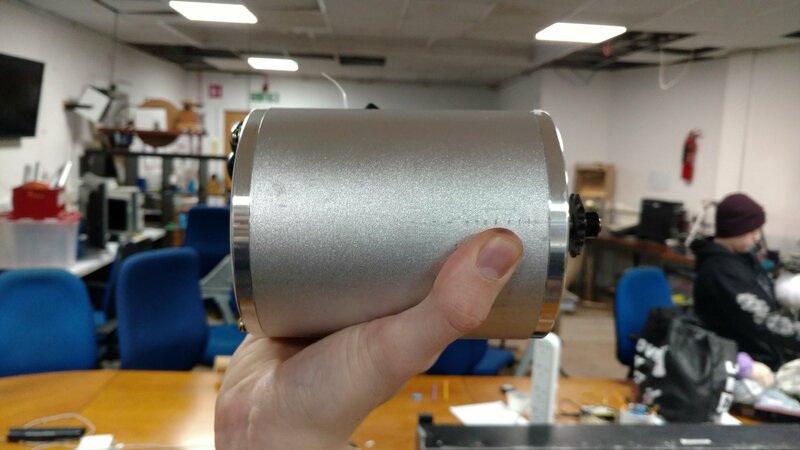 It all happened a week or so ago, when I spent a quiet afternoon at work perusing the finest of Chinese brushless motors on eBay when my eyes landed upon a most glorious 48V, 2kW brushless motor. The motor is pretty huge – the photo below uses my hand for comparison – and weighs a fair chunk too (I’d estimate around 5kg). For an idea of the size of the motor, here’s me cradling it in my hand. I tried to hook it up to my scooter controller (which is a “200A” model aeroplane ESC) but it barely attempted to spin it – our best guess why is that the controller couldn’t lock in to the rotor position, and gradually fell further & further out of sync until it hiccuped and snapped back into sync. It kept repeating this over and over again. The next step is to try figure out wheel mounting, and manage to mate motor & wheel to be one thing so that they can both turn. Me & Aidan both spent some time yesterday deciding on the best way to do this, which will be detailed in another post.